- This beautiful mermaid is just waiting to swim into your heart. Place her in a sunny window, and remember the call of the sea. Designed by Victoria Fraser from Blossom-Graphics. Made of aqua glass, approximately 4" in diameter. Comes with a hemp cord and glass beads for hanging. The glass suncatchers on this page are made for us by the St. Vincent de Paul Society. These suncatchers are made from recycled glass. The foundry uses the money raised from their sales to assist homeless and low-income people through emergency services, housing, jobs, training, and other charitable endeavors. How cool is that! 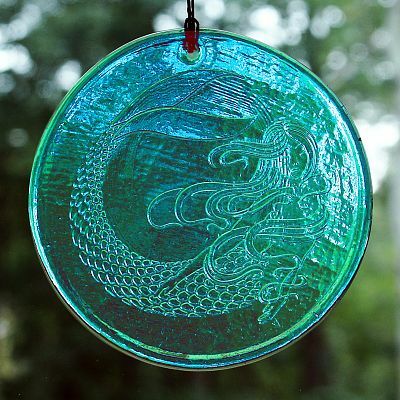 Do you have any other questions about our Mermaid Suncatcher?